When will the Brewers end their Gold Glove drought? Sports Stats ‘on Tapp’ is a sports statistics blog published with a focus on stats that go beyond the numbers. Could this season be the year that the Milwaukee Brewers finally end their long drought of not having a Gold Glove winner? Last season two Brewers made the final cut as finalists for the National League Gold Glove team – third baseman Aramis Ramirez and left fielder Ryan Braun. Both, however, did not win the award at their respective position. 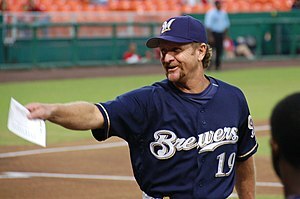 The Brewers have not had a Gold Glove recipient since 1982 when Robin Yount was the Gold Glove honoree at shortstop for the American League Brewers. Do the math and that’s now 30 years that have passed since a Milwaukee player has received a defensive award. Following are the six franchises that have not had a Gold Glove winner since 2010. Last year, Philadelphia Phillies shortstop Jimmy Rollins won an N.L. Gold Glove making it six consecutive years that the Phillies have had a Gold Glove winner. It is the longest active streak of Gold Glove winners in the majors. Three others teams have had a Gold Glove winner in at least three consecutive years: St. Louis (active streak of five straight years); Chicago White Sox (active streak of four straight years); Colorado (active streak of three straight years). The St. Louis Cardinals have had the most Gold Glove winners since 2000 with 25. That number tops the majors and the National League. Leading the way in the American League are the Seattle Mariners who have had 21 Gold Glove recipients since 2000. Following are the number of Gold Gloves won by each franchise since 2000.